Helpful tips and suggestions for taking majestic photos of the moon. In his article about How to Photograph the Moon, James Jordan explains how to photograph this fascinating subject at night, at twilight and with moonlight only. In this related article, James focuses on more nitty-gritty moon photography tips: best times at night, adding drama to your photos and helpful camera accessories. I track the times for sunset and moonrise as the full moon approaches. The best time to shoot the moon and still catch enough light to capture details on the ground is when the moon rises within a half hour before sunset. Most weather Web sites feature a section that lists times for sunset and moonrise. 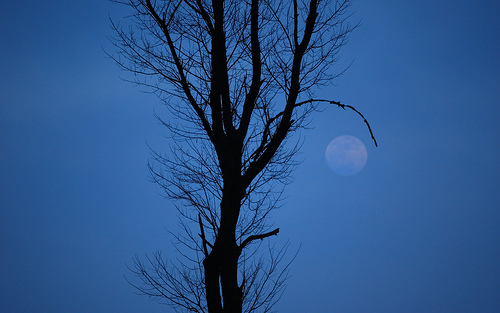 Add drama to your moon photos by including earthbound objects as silhouettes. If it’s light enough to catch the moon and the landscape in front of you, try shooting from a low angle to add drama and majesty to your moonrise picture. Try to shoot the moon within 15 to 20 minutes of moonrise. After that time, the moon will be too bright to capture without making everything else in the picture too dark. Catch the moonrise a day or two before you plan to go out shooting and take note of the direction from which the moon will appear. I’ve had more than one moon shoot go sour because the moon came up in a different spot than I had anticipated, rendering my carefully staked out position worthless and necessitating a scramble to a new spot. Use a photo editing program to crop your photo to make the moon appear larger. While a full moon gets all the attention, don’t ignore a crescent moon. When the moon is less than full, sunlight hits the surface at an angle, creating shadows that make craters and other surface features stand out more than when the light hits the surface straight on, as it does when full. I photographed the sun in practical eclipse using my digital camera and a pair of sunglasses.